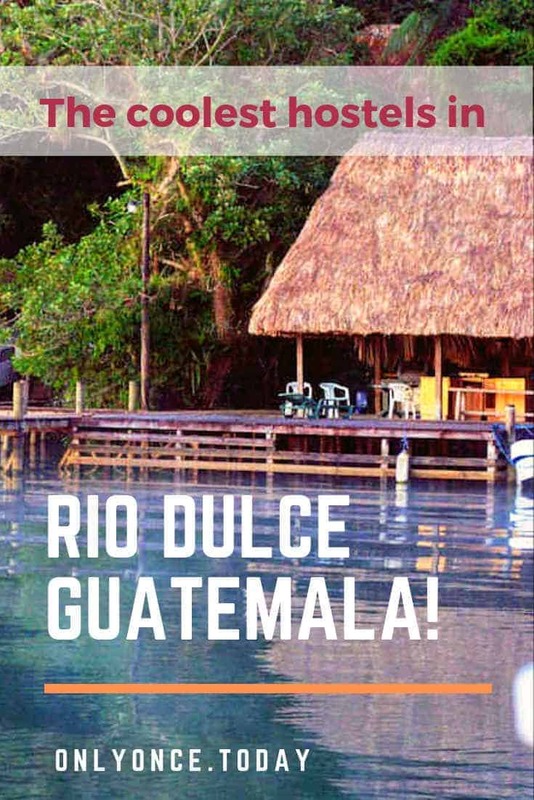 Rio Dulce is a backpacker hotspot in Guatemala! You should definitely include it in your itinerary! In this area, you have 3 major options for spending the night. You can either get a hostel in Rio Dulce town, spend the night in a river finca, or find a hostel in Livingston. We tried two of these options: one in Rio Dulce town and a river finca. And both are great options. The village is a good place to spend one night before you have an early start to continue your journey. But we definitely recommend staying in a river lodge as well. This guide will take you through the different lodging options. 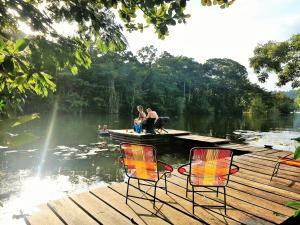 Read our Rio Dulce travel guide here. 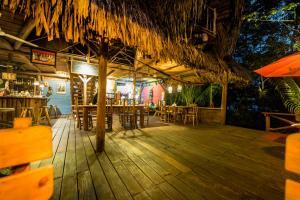 Keep scrolling to discover the coolest Rio Dulce Hostels! Tortugal Lodge is in Rio Dulce town, or right next to it. Its location gives you the village nearby, while still being surrounded by nature. 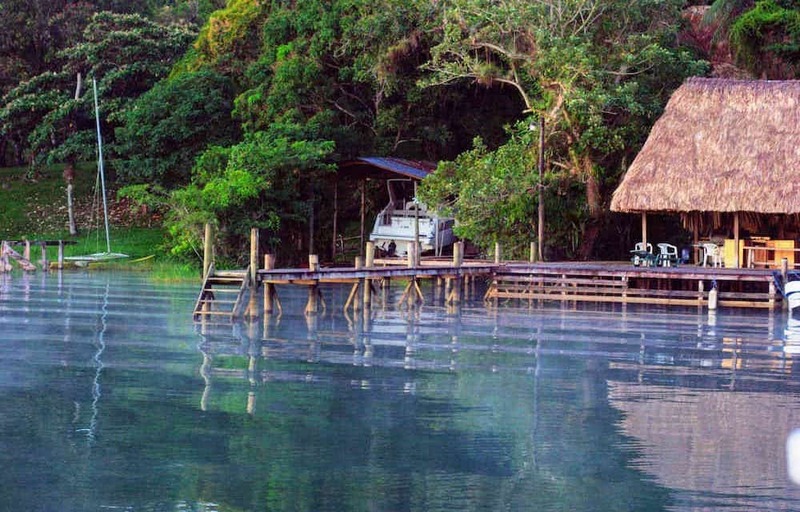 This lodge is definitely one of your best options for staying in Rio Dulce. We recommend this place instead of the hostels that are really inside of the town because this place is actually magical. Most hostels in Rio Dulce town are not nearly as beautiful or idyllic as this one! Tortugal is not the cheapest accommodation on the lake, but it sure is beautiful! We stayed in Finca Tatin and loved our stay a lot. The finca has river access and it’s located in the jungle as well. There’s an on-site restaurant with a set daily menu. Like most river lodges, this place runs on a generator which gets turned off at night. During the night, there’s solar power for lighting. There’s also a heated hut or sweathut on the property. 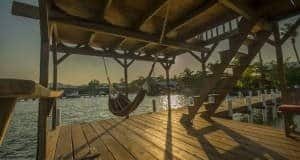 In Fanca Tatin, you can get private riverfront cabanas, private jungle cabanas, or beds in a dorm room. The Round House Hostel is an absolute traveler favorite. If you’ve been traveling around Guatemala for a few weeks, chances are good that you meet again with travelers you met before! Everyone seems to be going here. This lodge resembles a hostel the most, while still being a river lodge at the same time. The Round House is actually closer to Livingston than it is to Rio Dulce and it is completely surrounded by jungle. There are an on-site restaurant and bar. In the Round House, you can get a private room or a dorm bed. 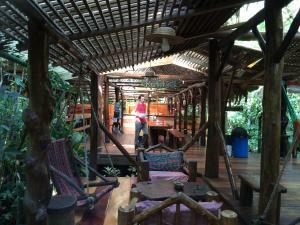 El Hotelito Perdido is a cute and cozy hostel in the jungle surrounding the Sweet River. This place gets an incredible guest score and people tend to stay longer than intended. Hotelito Perdido is another one of these travelers favorites for the area. It’s located almost in the middle between Rio Dulce and Livingston. This hostel also has an on-site restaurant and bar. You can either book a bed in a dorm room or get yourself a private room. Hotel Casa Perico is another river lodge, located in one of the side rivers of El Golfete. This lodge has an on-site restaurant and bar. With its stunning location, it’s one of Rio Dulce’s travelers’ favorites. A shuttle will bring you from town to your lodging. On top of that, they will also help you take care of onward travel plans and book your transportation to various destinations. Casa Perica has an on-site restaurant and bar. You can book beds in a dorm, but also private accommodation. Dreamcatcher Eco Lodge is located on the wider part of the river. The lodge has a private beach and an eclectic feel to it. This lodge is an excellent accommodation for romance. This lodge is pretty near the Rio Dulce town, but still on the river banks and very much in the jungle! From this accommodation, you have straight access to the river. It takes around 5 min to get to Rio Dulce and 40 min to get to Livingston. There are an on-site restaurant and common areas. You can either get a dorm bed or a private room in this lodge. Casa Nostra is the coolest hostel in Livingston. It offers beach access and it’s near the town. This hostel sells out really quickly, so if you want to stay in this little piece of heaven, plan ahead! They have a bar and a restaurant on-site. Meals are affordable and delicious. In Casa Nostra, you can book the most beautiful private rooms in the area! La Casa Rosada is just outside the city center of Livingston. It has a private beach looking out over the Caribbean Sea. Even though this place is still closely connected to the jungle, its beach location is an absolute plus! This place is super popular, so check availability in time! In Casa Rosada, you can book private cabins, as well as, shared dorm beds. River lodges usually arrange pick up from the town. You can better use this option than finding a boat once you arrive. Hostel pick up is usually free of charge, while the river taxi’s might overcharge you. You will be staying in the middle of the Guatemalan jungle. Expect that there will be tons of mosquitos and other crawling creatures. 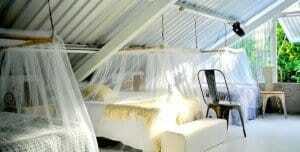 Most hostels do have mosuito netting for the beds, but you will still need to protect your skin! So! Where should you stay? Still doubting about the best option for your stay? I understand, we had a hard time choosing as well. Two options are easy! If you want to stay near the Rio Dulce town, for instance: for a late arrival at night or an early start in the morning, stay at Tortugal, it’s a beautiful lodge! The other easy one is Livingston. 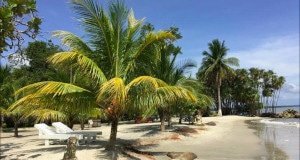 If you want to spend a few nights at the Caribbean beach and discover the Garifuna community in Livingston, stay at the Casa Nostra! You will definitely have an awesome time there! For the river lodges, the choice is more difficult! All of these lodges offer somewhat the same things, like jungle access, river access, a backpacker vibe, and on-site restaurants and bars. In the end, they’re all great lodges and you never know who you’ll meet in these places! Traveling to more destinations in Guatemala? Don’t forget to read our complete guide to backpacking Guatemala!